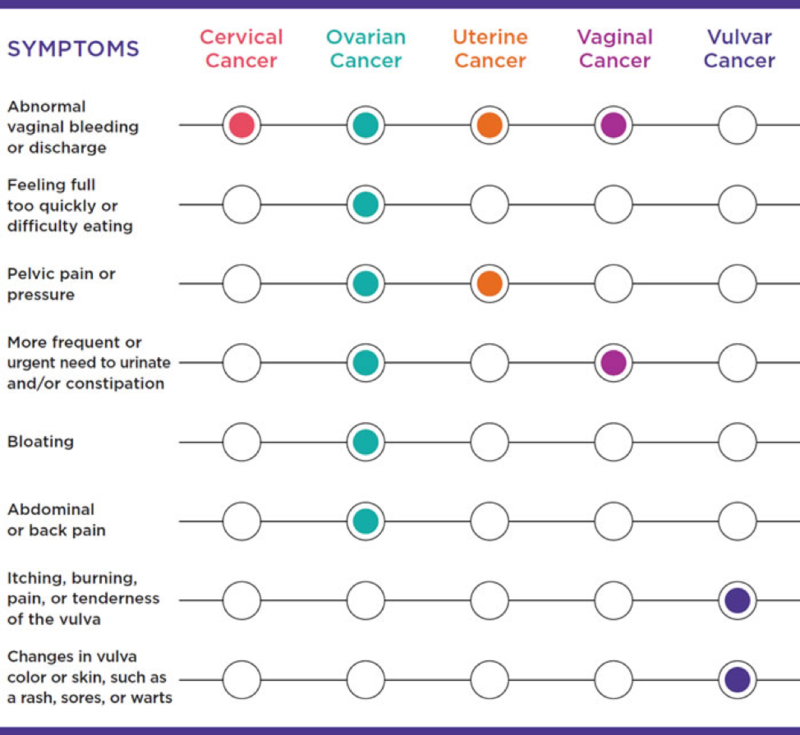 Causes, risk factors, and symptoms vary among the different types of cancer, making each gynecologic cancer unique. One commonality, however, is that when gynecologic cancers are found early, treatment is most effective. What are the risk factors for developing a gynecologic cancer? All women are at risk for developing a gynecologic cancer, and the risk increases with age. However, this does not mean that all women will develop one of these cancers. While different cancers have different risk factors, there are some common risk factors. Family history - not all gynecologic cancers have hereditary genes. Share your family history of cancer with your doctor and s/he should be able to tell you if genetics may be a risk factor. It’s important to remember that many women with one or more risk factors never develop gynecologic cancer–and although there is no proven way to completely prevent these diseases, there may be steps you can take to lower your cancer risk. Talk with your doctor if you have concerns about your personal risk of developing any type of gynecologic cancer. Also, ask your doctor about genetic testing if you have a family history that includes ovarian, breast, endometrial or colon cancers. See your gynecologist if you experience one or more of these symptoms for more than a month. It’s also important to regularly visit your gynecologist for an exam, even if symptoms are not present. What should I ask my doctor about gynecologic cancer testing? What is a Pap test and what is its purpose? A Pap (Papanicolaou) test, also called a Pap smear, is a procedure to test for gynecological cancer in women. It involves collecting cells from your cervix so that they can be looked at under the microscope to find cancer and pre-cancer. The main purpose of screening with the Pap test is to detect abnormal cells that may develop into cancer if left untreated. The Pap test can also find non-cancerous conditions, such as infections and inflammation. It can also find cancer cells. When should I have my next Pap test? The frequency of your pap tests typically depends on your age and health history. Your doctor will be able to determine how often you should get screened. What do my Pap test results mean? Pap tests are not perfect. Results can come back as normal, abnormal, and inconclusive. They can even be a false positive and false negative. Results other than normal do not necessarily mean that you have cancer. Your doctor will suggest more tests if they are needed. Is the HPV test right for me? HPV tests are not recommended for women under the age of 30. In most cases, HPV tests are conducted with a Pap test (co-testing) every 5 years. Talk to your doctor about co-testing if you are age 30-65. When can I stop getting a Pap test? Most women ages 21 to 65 should be screened regularly. Even postmenopausal women who are still younger than 65 still need regular Pap tests. Women who have had a hysterectomy, and/or women who have no history of cervical cancer or abnormal Pap results, and/or women who are older than 65 and have had 3 normal Pap tests in a row do not need Pap tests. Your doctor can help you determine when it’s the right time to stop getting screened. Are there any other gynecologic cancer tests that I need, based on my personal health and family cancer history? If so, what are they? Why do I need them? How do they work? In addition to Pap smears, women who are 18 years of age or sexually active should consider a pelvic exam. Women beginning menopause that are also considered high risk may want to consider an endometrial tissue sample. Patients who have a known family history of breast or gynecological cancers may consider genetic testing to see if they carry a specific gene mutation that could increase their risk of cancer. Your doctor will be able to discuss additional options with you.